In every aspect of your professional life, once you get too comfortable with the status quo and stop learning and improving your skills, you are putting yourself at risk of being left behind. That is the main reason why business owners in highly competitive industries, like the restaurant one, are constantly seeking new ways to improve their teams. A better and more skilful team can make a big difference when trying to beat the competition. When ensuring additional training and education for their staff, restaurant businesses employ a top-to-bottom approach. Or in other words – they usually start from the employees at managerial positions. 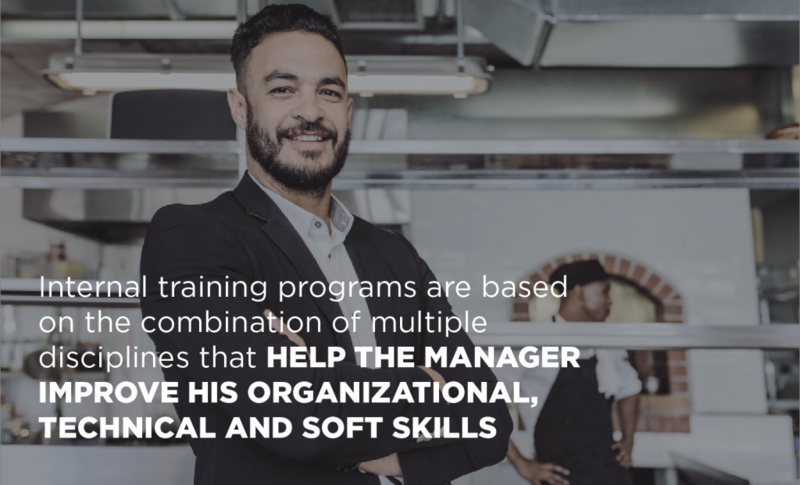 Ensuring a valuable restaurant management training is crucial for the future success of the business. Restaurant management usually serves as a bridge between the owner and his staff. That is why entrepreneurs pay significant attention to the process of hiring managers for their teams. By employing pro-active individuals, that share the core values and the future vision of the business, restaurant owners are basically ensuring the perfect foundation for their successful long-term operation. Managers are usually responsible for a whole range of inner processes, such as hiring and firing employees, training programs, PR and marketing, process optimization, etc. They are also the ones who organize internal training for instilling the values and the philosophy of the business within the whole team. In order to successfully handle the wide variety of tasks, that restaurant managers are responsible for, they need to be up-to-date with the industry’s best practices and constantly learning valuable information and gaining insights. Business owners usually handle this by enrolling their managers for different types of courses and training programs, some of which are focused on soft and technical skills, culinary arts, marketing communication, business analytics, payment processing methodologies, etc. By gaining a broad knowledge about the different aspects of the restaurant’s operation, managers can, later on, transfer their knowledge to their colleagues and significantly optimize the efficiency and the overall functionality of the whole business. By investing in your restaurant manager, you are basically investing in the future of your business. The manager is the head of the whole process which is why making sure that he is involved in periodical training and educational programs is essential for driving your business to new heights. Business owners often struggle with the process of finding suitable training programs for their management staff due to the fact that there are plenty of educational centers, offering various types of courses. The process of choosing the right ones should be gradual, starting from the basic material and then focusing on the niche-specific skills. The best educational materials are usually offered by leading industry organizations. While the external knowledge is valuable in terms of getting to know the industry and how to manage a restaurant efficiently, it is always better to combine it with some internal training programs. Think about it the following way – external courses teach about the industry, while internal training teaches about the particular restaurant and the processes within. That is why a combination of both is very important. This course is claimed to be “the country’s preeminent food business program of study, offering the pragmatic training in restaurant management, operations and entrepreneurship”. It is taught by practitioners and expert consultants and provides valuable insights into how to overcome restaurant and bar management issues related to operations and staffing. The course focuses also on trend and industry analysis while relying heavily on the financial aspect of restaurant management. The program is comprised of 5 different modules, divided into 9 courses. The whole length of the course is 316 hours or 7 to 9 months. There are two ways of taking the course which defines the tuition. For evening and hybrid classes it is $13 980, while for morning and evening activities, it is $15 530. The course is online based, which provides restaurant managers with the option to work and study simultaneously, thus applying what they have learned in their real-time day-to-day activities. The lectures are very diversified in their backgrounds – from certified instructors, through success coaches, to teaching assistants and student support staff. The curriculum includes Legal Aspects and Insurance, Hospitality Accounting, Cost Controlling, Marketing and Sales, Menu Planning, People Management, Food Preparation, Food Service Sanitation, and many others. The cost of the course is in the range of $650 – $799, depending on the preferred payment scheme. The program is often preferred due to its flexibility and affordable price. Depending on the intensity of the student, the course can be finished in less than 4 months. 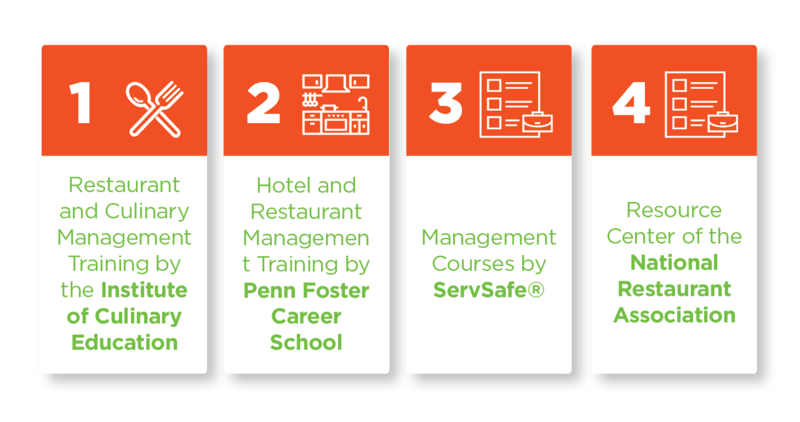 ServSafe® is considered the premier provider of food safety training programs and certifications. Students can choose from 3 options of studying, such as an online course, an instructor-led course, and a self-study option. The company is administered by the National Restaurant Association and the exam for the ServSafe® Food Protection Manager Certification is accredited by the American National Standards Institute (ANSI) and the Conference for Food Protection (CFP). The exam provider suggests that each individual, willing to get certified, should check the respective state requirements. The costs of the course materials and certification exams can be found here. The National Restaurant Association does a great job of providing valuable information, thorough researches and useful tips and tricks to its website’s visitors. In order to be aware of all the recent industry updates and find out interesting learning opportunities, a great idea is to check the website every once in a while. Each restaurant manager should aim for making the association’s website his go-to resource for gaining additional knowledge. It is free and tops the list for finding the best readings with the morning coffee. 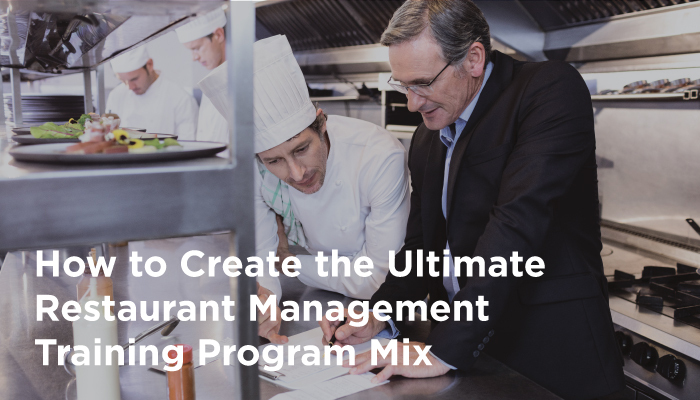 A proven way for achieving the perfect educational mix for your restaurant manager is to combine an enrollment in professional courses, taught by leading organizations with some internal training programs. The idea behind internal training is mostly focused on learning how to adapt the gained knowledge from external learning programs for optimizing the processes and the efficiency of the particular business unit. Internal training programs are based on the combination of multiple disciplines that help the manager improve his organizational, technical and soft skills. Business management is a very complex process, due to the fact that managers should be able to handle each and every issue, arising within the business unit. This requires a multi-dimensional approach and wide knowledge about each of the processes within the restaurant. From profit optimization, through client growth strategies, to the legal aspect, business management requires attention to details and pro-active attitude. In order to be able to handle all that effectively, managers should be knowledgeable enough to make data-driven decisions. Whether it is how to handle inventory, decide on the appropriate prices or reduce overall costs, the most important thing is to be able to analyze data and derive conclusions from it. By learning more about predictive analytics and business optimization strategies, the restaurant manager will be able to achieve the goals that you have set easily. Being knowledgeable about business foundations does not require only business skills, but technical as well. As the industry is widely adopting advanced digital solutions, restaurant managers should be comfortable with POS, reporting, invoicing, etc. Only a pro-active individual can become a good restaurant manager. That is why, it is your duty, as a restaurant owner, to make sure that you are hiring a person who is willing to become a better professional by dedicating his time to self-improvement and education. Once you’ve found the perfect fit for the respective position within your business, it is time to provide him with all the needed resources and learning material. As we’ve already said, enrolling your manager in management courses by leading external authorities and industry-specific organizations should be the main point of your strategy. Once your manager completes such a program, it is time to focus on the little details. A great way to start is to provide your manager with personal recommendations about the way you want your restaurant to be managed. This includes the main philosophy and concept of the business, the internal processes and their optimization, goal setting, etc. The manager will then be responsible to build a strategy to execute the tasks and transfer his ideas to the whole staff. Make sure to keep your manager accountable for the whole process. That way you can keep him organized and motivated to achieve his goals. And no matter what goals he has set for himself and for the overall performance of the business, the only way for them to be achieved is through good organization. If the manager is the head of the business, the staff is its spine. That is why it is important to make sure that your restaurant manager is a caring person, who is willing to step up for his team in complex situations and is focused on creating a great bond between each and every employee. He is the one who is in responsible for improving the staff morale and should be focused on keeping the spirit high by making sure that everyone is feeling comfortable and enjoying their work environment. A very effective strategy for keeping the staff satisfied and increase the employee retention rate is to conduct periodical surveys for examining their feelings towards their work. That way, the manager shows his team that he cares about their satisfaction and is willing to listen to their suggestions. By analyzing the internal feedback, the manager can then make conclusions and build a strategy for improving the working conditions, the way some processes are handled and the overall operation of the business unit. Restaurant managers should not forget the fact that their colleagues are those who see things from other perspective and are usually the best points of reference for the respective duties within the business. Although the manager may be the most qualified and knowledgeable overall, he surely isn’t the best bartender, cook or waiter. That is why it is very important to constantly gather feedback from the whole team or at least the heads of the different departments within the restaurant. One of the critically important duties of restaurant managers is making sure that all visitors are satisfied with the service. 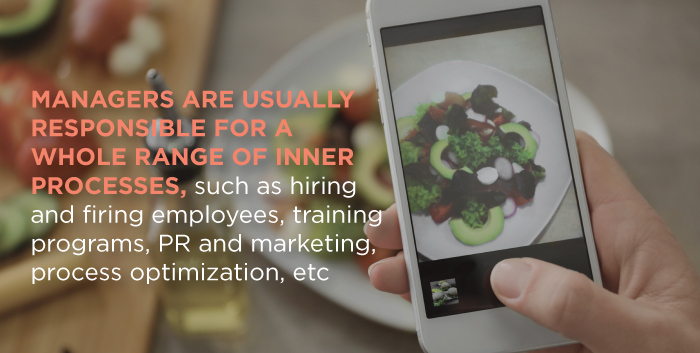 In order to be able to do that, a manager will need good organizational, communicational and digital marketing skills. While the need for organizational and communication skills is pretty self-explanatory for the internal processes and the overall client satisfaction, the digital marketing expertise is equally essential, due to the importance of customers’ reviews. A restaurant manager is responsible for managing the online presence of the business and tracking customer opinions on social media or sites/apps for reviews. No matter how good a service is, if there are no references for it, it is losing potential clients. That is why it is very important to employ a gamification strategy to help engaging the restaurant’s visitors to make them a valuable part of the whole experience. An important thing to remember is that a negative review is way more powerful than a number of positive ones. In order to avoid having bad feedback on the internet, a restaurant manager should focus on a strategy to enhance the service, increase the customers’ satisfaction and make them willing to share it with their followers or the wide audience. Apart from digital marketing, the successful restaurant manager needs to understand basic marketing, communications, PR and advertising methodologies, so that he can further develop and expand brand awareness. Aside from managing people, heads of restaurants should be knowledgeable in food and beverage management as well. By joining forces with cooks and bartenders, the manager can decide on the appropriate supplies and products that are needed and ensure their purchase, logistics, and storage. In fact, this task is not an easy one. The whole food and beverage management process is very complex, due to the fact that creating the menu and choosing each and every item to be included requires substantial planning and is fundamental to the restaurant’s ability to distinguish itself from its competitors. Although restaurant owners often tend to teach their managers about all this by themselves, so that everything is tailored to the specific business’ needs, it is always better to take a look from the outside or take advantage of additional knowledge on the topic. 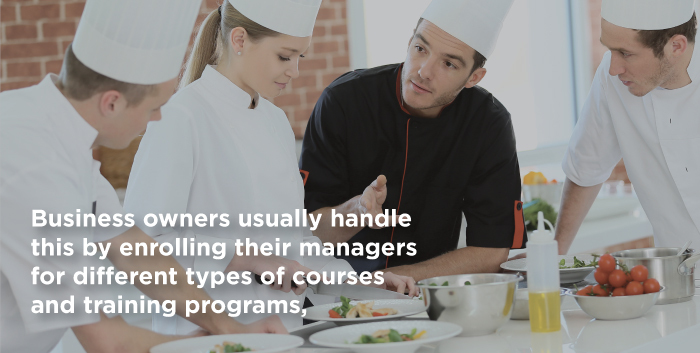 Remember that, when it comes to restaurant management education, the truth is that relying on only one training program is rarely enough. 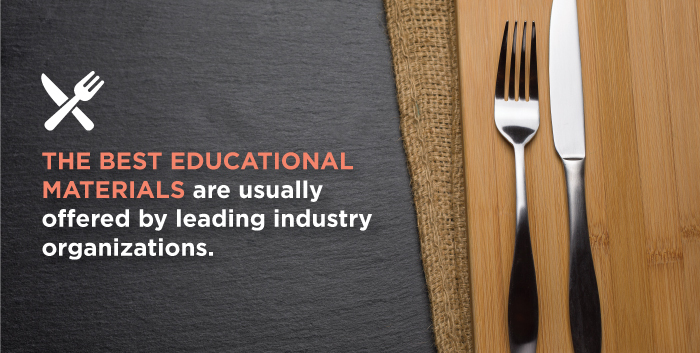 By adopting different learning strategies and focusing on various topics, a manager can gain a complete understanding of all the aspects of the restaurant industry. Yet, no matter how many courses a manager has taken or in how many educational programs he was enrolled, if the skills and expertise are not applied on practice, they can sooner rather than later, be forgotten or become irrelevant. 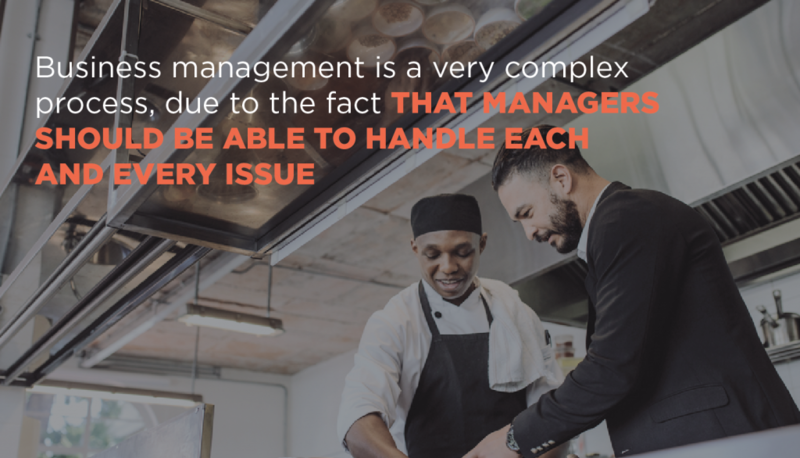 One of the most important things that a restaurant manager has to do, is to make sure that he is focused on the constant improvement of his management staff. The training process never really ends. Once a course is finished, the manager should be already looking for a new one to keep up with the learning process. Training programs should be considered as investments that are crucial for the future success of a certain business, rather than a cost. Last, but not least, do not forget that the manager is not only a learner but a teacher as well. He is the one responsible for the transfer of knowledge and open communication within the team. Teaching and learning go hand-in-hand and should be applied on a daily basis. This is the only recipe that can guarantee success in the long-term.